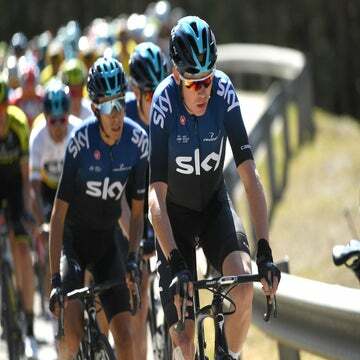 MONTPELLIER, France (VN) — A week before the start of the Tour de France, pre-race favorite Chris Froome (Sky) was caught up in a brouhaha because he failed to respond to a request to release his power number on the internet. Clean cycling advocate Bike Pure had requested Froome share his power meter numbers to be posted on the site for public consumption. When he didn’t respond, the site “dropped” him from its list of endorsed riders, creating a stir in social media. Teams, however, are loath to release power numbers for a variety of reasons. VeloNews spoke to Sky principal Sir Dave Brailsford to ask why teams keep power outputs and performance data under lock and key. VeloNews: Froome declined to release his power numbers publicly, why? Dave Brailsford: It’s an interesting question. There is so much pseudo science out there right now. If you release the data, there are very few people who can properly interpret and understand that data. All you’re going to do is create is a lot of noise for people who are pseudo scientists. You can even write magazines about it. They’re so wide of the mark in what they’re doing, it’s quite scary. You can do anything with stats. You can use that with a cynical view. VN: And that information would be available to your rivals? DB: It’s our competitive advantage [Brailsford compared it to a journalist sharing a scoop with rivals]. It’s not how the world works. We want to be open and transparent, but that’s why the biological passport is actually a good thing. You have an agreed panel of experts, you agree to a collective decision, they know how to analyze it. If we evolved and worked on that principle, then it’s something we’d be interested in. If people could truly understand and interpret power, what it is and what it isn’t, and it isn’t what a lot of people think it is. You get all kinds of readings. We look at power numbers every day, and you get these anomalies, you get these quirks, if things are not quite calibrated correctly, or if something else is wrong. All of those things need to be taken into account, just like the biological passport. There is a fruitful area of debate and opportunity in terms of what power data could provide, I am very pro-that, but just releasing it in general is not the right way to go. VN: People seem to draw conclusions based on the numbers, but are they correct conclusions? DB: At some point in time, people have to accept that performances are going to move forward. If we always hold back, and say, here is some data from people who were doping, then if we draw a line, we can then deduce that anyone crossing that line must also be doping. Well, that’s false. They do not have to be doping, because the whole human race moves forward. At some point in time, clean performances will surpass the doped performances in the past. You cannot use that as a rule to say that means that they are doping. VN: What kind of variables or conditions can influence power readings? DB: Add temperature, wind, road conditions, normalized VAM, normalized power; we know aerodynamic drags of our riders, and even with that it’s hard, so when people start saying, we’ll just assume this and that, come on, guys, if you have to have true scientific rigor, you would know what you’re doing is not scientifically. VN: Power meters have become essential to training, but riders seem to be racing off them as well. How important has it become during the race to have the meters? DB: The race is about keeping up with your opponent. You can sit and look at your power meter all day, but you’re not going to win. The power meters are a tool that can help, and guide, and help a rider perform, but they are not they’re as a control mechanism. People have a misconception about how we use power. Information is there to help with decision-making. You cannot control everything. The more you understand about what you have to do, the better you understand about what you can actually maximize your capabilities. It’s not about riding to this [power target], ride to that. It’s bit like when heart-rate monitors came out, and people misinterpreted them. It’s there to serve as a guide. It’s there to inform how to improve a performance, but there has to be spontaneity about it, and a human aspect to it as well.